One easy way to add QR codes to three-dimensional shapes. Scanova : QR Code Generator and Designer. Our superfast online generator and designer will help you create high-quality and beautiful QR Codes for all your marketing promotions and operational requirements. We strive to help people leverage the potential of QR Codes in their marketing campaigns in the most affordable way. Through our designer, you can easily blend the qr code generated in your own designs. Norton Snap is a QR code scanner that protects your mobile device and your personal information from dangerous QR codes. Block unsafe websites before they load and steal your data. Be alerted to potential online threats. As mobile learning becomes more and more prevalent, we must find effective ways to leverage mobile tools in the classroom. As always, the tool must fit the need. Mobile learning can create both the tool and the need. With safe and specific structures, mobile learning tools can harness the excitement of technology with the purpose of effective instruction. Using QR codes for instruction is one example of this. Images in Your QR Codes! Visualead is fantastic site that let’s users combine QR codes with images. You can upload any picture that you want and place your QR code right on top of it. Not only is it a great way to energize traditional black and white QR codes, adding images can help students distinguish between QR codes in different subject areas or lessons. This is perfect for younger students or English Language Learners. With Visualead, anyone can integrate a QR Code into any image, blending the familiar QR Codes that people recognize, with the visual design that people love. Visual QR Codes have been shown to increase engagement significantly, creating a communicative, creative and effective visual calls-to-action from print to mobile. QRphoria : create colourful QR Codes ... also url shortener. QRphoria is fast, free, and easy to use for everyone. Subscribers get added perks including a personal dashboard, tracking, reporting, editing, more export options, and previews of new features and styles. A QR Code is the fastest way into a phone’s contact list. You can embed your name, phone numbers, email, website, address and more in a QR Code, rather than asking anyone to type all of that in. Chirp .. is this a threat competitor to QR codes? You might probably be asking yourself " what these codes have to do with education ? "Well that is what this article is trying to answer. TagMyDoc allows you to apply a [QR Code] tag on a document which can be scanned and retrieved as a virtual copy. Looking at the increasing scope of QR codes, and the amount of information they can store, we’ve come up with a few observations on how they can be used in online classes. The efficacy of QR codes in learning can also be seen in Bath University’s Head of E-Learning, Andy Ramsden’s, working paper: The use of QR codes in Education: A getting started guide for academics. Video showing how QR codes can be added to second life. Once installed, QRreader Beta helps users read QR codes without any mobile application. Once installed, the extension adds an option to read QR codes in Chrome’s right click menu. Just browse any website, right click on the QR code and click on the “Read QR Code from image” button. If the QR code has any link attached to it, it will be opened in a new tab automatically. On the other hand, if there is any text linked to it, it will be displayed in a popup window. The study found that for the month of June 2011, 14 million mobile device users in the U.S. scanned a QR code. That's about 6 percent of the total mobile audience, according to comScore. Those 14 million users were most likely to do their scanning in a magazine or newspaper, says the report-49.4 percent of the audience scan the codes found in them. Product packaging is the second most popular source for code scans at 35.3 percent, followed by Web sites on PCs at 27.4 percent. Posters, flyers or kiosks represented 23.5 percent of scanned codes. In the same way that bar codes don’t have to be boring, quick response codes can also be creative. Thanks to a 30% tolerance in readability, you can have some real fun with clever designs. Besides looking good, this can also make them more successful. If the Famous Five were characters today, the one object they would all have had was a mobile phone. We therefore decided to plan an activity around using QR Codes to navigate a route. A list of blog posts from David Hopkins on QR Codes, what are they, how do you use them, and how they can be used to improve and enhance the student experience. Add a Paperlink to a window, a product, an ad, a poster or anything, and watch people interact with you or your brand on a whole new level, using the free Paperlinks iPhone app. Essentially, Paperlinks creates QR codes for businesses and brands but with a particular focus on the design of the code itself. The actual code can incorporate the logo of a brand or business. Gust MEES curates this topic from blogs, tweets, videos and much more: find out how. I have been thinking alot about QR codes for a while now, and how we could apply them in our library to start with, and then widen their use across campus. I wanted it to be something meaningful, that students would want to connect to, rather than just a fun or novelty thing to do that was cool without much substance. The fifth graders at Brook Forest Elementary in Oak Brook, IL, don't have their own smartphones—yet. But they're learning about one of the latest trends in mobile media: Quick Response Codes, QR codes for short. There are ways to begin exploring the integration of the digital and physical worlds. They include the quick response (QR) code, a more complex barcode that can transmit a larger amount of information. Whether you’re looking to spread information in a smart, tech-savvy way or increase interactivity around library services, QR codes are a great way to start. They provide a first step toward the fully immersive experience of augmented reality,without having to spend a lot of loot. 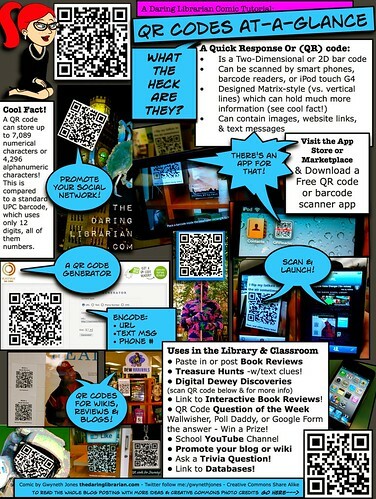 A couple of hours and a few sheets of labels or sticker paper and you, too, can have a QR-encoded library.